The sphere of His bright face resembles a wandering autumnal moon, His pure complexion glistens, His gait is like that of an elephant, He is utterly intoxicated in Love of God, krishna-prema, He is the personification of pure spiritual energy (vishuddha-sattva) and His face is smiling. His eyes are always rolling from intoxication of divine love; His hand holds a staff, and [beating His staff on the ground strongly and loudly chanting “Haribol!”] He dispels the evil forces of this age of Kali. I perpetually worship Shrī Nityānanda Prabhu, the root of the tree of devotion (bhakti) to God. He is the abode of all transcendental relationships with God, rasas; He is everything to His devotees; He is beyond compare; and He is the dear husband of Vasudha and Jāhnavā-devī, who are His very life. He is always maddened in divine love, prema, and He is unknown only to those of mundane intelligence. I perpetually worship Shrī Nityānanda Prabhu, the root of the tree of devotion (bhakti) to God. He is most dear to Mother Shachi’s son (Chaitanya Mahāprabhu), He is worshiped by the entire universe, and He is forever filled with joy. By His unbounded mercy, He rescues the souls drowning in this iron age of Kali, and by performing shrī–harināma–sankīrtan, chanting of God’s holy names, He evaporates the swelling pride in this ocean of mundane existence. I perpetually worship Shrī Nityānanda Prabhu, the root of the tree of devotion (bhakti) to God. 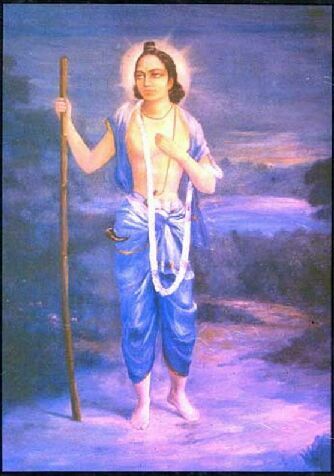 “O My brother, contaminated by the vices of the Iron age or Kali, what will become of mankind?” He thus advises the Supreme Lord, Shrī Krishna Chaitanya, “Please devise a method to purify the souls, whereby they can easily attain Your shelter.” I perpetually worship Shrī Nityānanda Prabhu, the root of the tree of devotion (bhakti) to God. “O brothers, simply chant incessantly the names of Shrī Hari, and let the responsibility of delivering you from the ocean of repeated birth and death rest upon Me.” While traveling constantly, He approached the door of every home, declaring this with outstretched arms. I perpetually worship Shrī Nityānanda Prabhu, the root of the tree of devotion to God. How astonishing! He is just like Agastya Muni [who once swallowed the entire ocean], forcibly swallowing the ocean of repeated birth and death. He is the rising moon that causes the ocean of saintly persons’ good fortune to swell. He is the brilliant sun, blazing before the multitude of rogues and dispelling the darkness of their ignorance. I perpetually worship Shrī Nityānanda Prabhu, the root of krishna–bhakti tree. Dancing, singing, and calling out the names of God, the very sight of Him delights the devotees. He roams every path, casting upon the saintly a glance from the corners of His merciful eyes. I perpetually worship Shrī Nityānanda Prabhu, the root of the tree of devotion (bhakti) to God. When He gently held the supremely soft lotus hand of His brother, Their hearts flooded in ecstasy as They gazed at each others’ faces. As He wandered here and there, He delighted the townspeople with His sweetness. I perpetually worship Shrī Nityānanda Prabhu, the root of the tree of devotion (bhakti) to God. May Shrī Nityānanda Prabhu’s two lotus feet brilliantly manifest in the hearts of those who recite this unprecedented and supremely potent Nityānand āshtakam, which is the reservoir of mellows, rasa, the treasure of exalted Vaishnavas who relish this mellows of divine love (rasika), and the abode of the essence of bhakti-ras. It bestows liberation upon all fallen souls who simply remember it.